Draft: 2008, Arizona Diamondbacks, 27th rd. Ryan William Cook…graduated from Clovis (CA) HS in 2005…attended University of Southern California…18-13 with 5.33 ERA in 46 games, 42 starts, in three years with USC…selected by Arizona in 27th round of 2008 MLB First-Year Player Draft. The Totals - Had an 18.69 ERA (18 ER, 8.2 IP) in 9 relief appearances for Oakland and Boston. ... Minor Work - With AAA Nashville and AAA Pawtucket, he combined to go 4-1 with a 3.16 ERA (15 ER, 42.2 IP) with 36 strikeouts. ... New Team - Acquired by Boston in exchange for PTBNL or cash considerations July 31; appeared in 5 games in three stints with Boston. ... On The Farm - His 8 saves with Nashville tied for the team lead...with Pawtucket did not allow a run in his 7 appearances, holding opponents to .067 average (2x30) in 9.1 IP. ... Good Start - With Nashville had a 1.80 ERA (3 ER, 16.0 IP) before allowing 12 runs in his next 10 games…finished stint with Nashville in his final 6 outings (6.0 IP). Appeared in 54 games despite two stints on the disabled list and was 1-3 with a save and a 3.42 ERA…the games pitched were his fewest in his three seasons with the A's and his ERA was his highest…struck out 50 batters in 50.0 innings…has 204 strikeouts in 198.1 career innings, an average of 9.26 per nine innings…allowed three home runs and has surrendered just nine in 198.1 career innings, an average of 0.41 per nine innings…allowed a .184 opponents batting average, which included a .138 (15-for-109) mark against right-handed hitters compared to .262 (17-for-65) against left-handers…had 13 walks and 13 strikeouts against lefties, nine walks and 37 strikeouts against righties…has a .180 (74-for-412) career average against right-handers, .236 (73-for-309) against left-handers…opponents hit .181 with the bases empty, .188 with runners on…allowed 12-of-29 (41.4%) inherited runners to score…has allowed 36-of-86 (41.9%) inherited runners to score in his career, which is the highest mark in the majorssince 2011 when he made his Major League debut…yielded a .265 batting average against first batters faced…had two blown saves and now has 16 over the last three years, which are the most in the AL…compiled a 1.89 ERA and .156 opponents batting average in 38 night games compared to an 8.25 ERAand .261 opponents batting average in 16 games during the day…walked 13 batters in 12.0 innings during the day, nine in 38.0 innings at night…did not allow a hit to the opponents number two hitter (0-for-18)…had a save and a 1.17 ERA in eight interleague appearances and has a 1.82 ERA in 26 career interleague appearances…did not make an error and has not committed an error in 208 career games and 39 total chances. Was 6-4 with two saves and a 2.54 ERA in a team-leading 71 relief appearances…allowed just two home runs in 67.1 innings, an average of 0.27 per nine innings, which was fourth lowest among American League relievers…has allowed just six home runs in 148.1 career innings (0.36 per nine innings)… his six wins tied for fourth among AL relievers and matched his career high from 2012…his 12 wins over the last two years are tied for second most among AL relievers…however, was charged with seven blown saves, which tied for fifth most in the AL and matched his career high from 2012 … his 14 blown saves over the last two seasons are the most in the AL and third most in the majors … allowed 15-of-30 (50.0%) inherited runners to score, which was the highest mark in the majors…it was the highest mark by an A's reliever since 1999 (Tim Worrell, 51.0%)…has allowed 24-of-57 (42.1%) inherited runners to score in his career…first batters faced were 11-for-65 (.169) with six walks (.239 on-base percentage) … opponents stole 16 bases with him on the mound, which tied for the most among Major League relievers and tied for 10th most among all AL pitchers…it was the most in Oakland history by a reliever (previous: 15; Rollie Fingers, 1976; Dave Heaverlo, 1978)…his opponents batting average included a .207 (31-for-150) mark against right-handed hitters compared to .279 (31-for-111) against left-handers…issued 19 of his 25 walks to lefties…now has a .195 (59-for-303) career average against righties…had a 0.71 ERA in 13 appearances on no days rest compared to 2.96 in 58 games on one day of rest or more … opponents hit .154 with runners in scoring position and two outs and have a .157 (13-for-83) mark in his career …did not allow a run in nine interleague appearances (9.1 ip, 3 h, 4 so)…compiled a 1.34 ERA in 32 games during the day compared to 3.74 in 39 games at night…has a 1.63 ERA (12 er in 66.1 ip) in 64 career day games, 3.29 (30 er in 82.0 ip) in 90 night games…had a 2.15 ERA in 40 games in Oakland compared to 3.03 in 31 games on the road…yielded both of his home runs on the road…tied for seventh among AL relievers in wild pitches (7) and tied for eighth in hit batters (4)…did not commit an error and has not made an error in 154 career games (28 total chances). OAKLAND: Walked a career-high three batters and hit another in his first appearance of the season April 2 against Seattle…allowed one run in that game but followed it up with an eight-game, 9.2 - inning scoreless streak, during which he allowed four hits and a walk while striking out 11…tossed 1.2 scoreless innings at Los Angeles (AL) April 9 for his first win of the season, a 9-5 A's victory…that extended his winning streak to a career-high five games dating back to July 18, 2012…had a season high three strikeouts in the game…pitched a scoreless ninth inning May 19 against Kansas City for his first save…did not allow a run on the road until May 26 at Houston when he allowed a season-high two … that snapped a 22.2-inning scoreless streak on the road dating back to Aug. 11, 2012 … the road scoreless streak is third longest in Oakland history by a reliever … allowed a season-high two runs on a career-high four hits in 0.2 innings June 22 at Seattle for his first loss of the season … then allowed just one earned run over his next 21 games from June 25 to Aug. 18 … was 4-1 with a save, a blown save, a 0.41 ERA and .154 opponents batting average over that span … issued just one walk in 13 games and 12.2 innings in June … had a season-high 12.1 inning scoreless streak from July 8 to Aug. 7…tossed a career-high tying 2.0 innings July 14 against Boston and picked up the win in the A's 3-2, 11-inning victory…also recorded the win in his next outing July 22 at Houston and then tossed 1.1 scoreless innings for his second save two days later against the Astros…did not allow an earned run in 11 games and 12.0 innings in July while holding the opposition to a .182 batting average…allowed his first home run of the season Aug. 10 at Toronto, a solo shot by Jose Reyes in the seventh inning … it was the first home run he allowed since Aug. 4, 2012 against Toronto (David Cooper), snapping a 72-game, 75.2-inning, 302-batters faced homerless streak…the 75.2-inning homerless streak was fifth longest in Oakland history by a reliever…picked up the win in back-to-back games Aug. 11 and 12 at Toronto … however, the win on the 12th came after blowing the save…was charged with four blown saves and two losses over his final 21 games…compiled a 4.11 ERA and .329 opponents batting average over that stretch and allowed 10-of-14 (71.4%) inherited runners to score…allowed at least one base runner in 16 consecutive games from Aug. 16 to Sept. 22 (.486 opponents on-base percentage) … yielded at least one hit in 12 consecutive games from Aug. 23 to Sept. 19 (.455 opponents batting average)…matched his career high with three walks Sept. 22 against Minnesota…appeared in one ALDS game against the Tigers, allowing two runs on a hit and a walk in 0.2 innings in Game 4 at Detroit. The 25-year-old rookie was the A's lone representative to the American League All-Star team...went 6-2 with 14 saves, a 2.09 ERA and .166 opponents batting average in 71 appearances...tied the Oakland rookie record for games pitched (Aaron Small, 1997) and had the third best save total...his ERA was fifth best among Oakland rookies with 50 or more innings...ranked second among AL rookies in saves and games pitched...however, had seven blown saves, which tied for second most among all AL pitchers...his save percentage of 66.7% was the lowest in the majors and tied for second lowest in Oakland history...it was the lowest since Jay Howell also had a mark of 66.7% in 1987 (16-for-24)...posted a 0.69 ERA and .085 opponents batting average over his first 24 appearances through June 8...then took over as the A's closer and logged a 5.24 ERA and .235 opponents average over a 24-game stretch from June 9 to Aug. 8...compiled a 0.72 ERA and .174 opponents average over his final 23 games after Balfour resumed the closer duties...allowed 15 of his 18 runs in the ninth inning for a 4.73 ERA...had a 0.58 ERA in all other innings...began the season with a 23.0 inning scoreless streak, posted a 4.33 ERA over a 36-game stretch from May 28 to Sept. 5 and then finished the season with a 15.0-inning scoreless streak...ranked third among AL relievers in opponents batting average, fourth in slugging percentage (.261), fifth in ERA, ninth in on-base percentage (.256) and tied for ninth in strikeouts (80)...the batting average was sixth lowest in Oakland history among relievers and the slugging percentage was ninth best...issued 21 walks in 32.2 innings over his first 32 appearances through June 25 (5.79 per nine innings)...then walked just six batters in 40.2 innings over his final 39 outings (1.33 per nine innings)...first batters faced were 13-for-64 (.203) with six walks (.271 on-base percentage)...allowed 8-of-25 (32.0%) inherited runners to score...tied for sixth among AL relievers in wins (6)...his .166 opponents batting average broke down to .162 (22-for-136) against right-handed hitters compared to .171 (20-for-117) against left-handers...surrendered three of his four home runs to lefties...three of his home runs allowed were solo shots...opponents hit .149 with runners in scoring position...allowed 12 of his 18 runs and was charged with five of his seven blown saves in 18 appearances on no days rest (6.48 ERA)...had a 0.79 ERA and was 12-for-14 (85.7%) in save opportunities in his other 53 games...logged a 0.72 ERA in 35 appearances on the road compared to a 3.53 ERA in 36 games at home...allowed all four of his home runs in Oakland...had a 1.41 ERA and .105 opponents batting average in 38 appearances at the All-Star Break...then posted a 2.83 ERA and .225 opponents batting average in 33 appearances after the break. Made his Major League debut with Arizona, posting a 7.04 ERA and .333 opponents batting average in12 relief appearances over three stints...struck out seven batters in 7.2 innings, but also walked eight fora .463 on-base percentage...did not allow an extra base hit...his opponents batting average included a.313 (5-for-16) mark against left-handed hitters compared to .353 (6-for-17) against right-handers...firstbatters faced were 5-for-11 (.455) with a walk...allowed 1 of 2 inherited runners to score...was selectedfrom Double-A Mobile July 20 and made his ML debut that day against Milwaukee...entered the gameto start the 10th inning and did not retire any of the four batters he faced...allowed three runs on threehits and a walk, wild pitch and balk for the loss in a 5-2 decision...surrendered another run in his nextouting July 22 against Colorado and was optioned to Triple-A Reno July 24...returned July 30 andrecorded his first strikeout that day at Los Angeles (NL), fanning Rod Barajas...faced the Dodgers thenext day, allowing two hits to the only two batters he faced...was optioned to Reno Aug. 1 with a 21.60ERA over four outings overall...returned for the final time Sept. 1 when rosters expanded and posted a3.00 ERA in eight relief appearances during his final stint. MINORS: Led the Diamondbacks farm system with 19 saves after being used exclusively as a starter overhis first three professional seasons...combined for a 1-5 record and a 2.21 ERA in 48 relief appearanceswith Mobile and Reno...converted 19-of-24 (79.2%) save opportunities...struck out 62 batters in 61.0innings...surrendered just two home runs...allowed a .192 opponents batting average, which included.179 (15-for-84) against left-handed hitters and .200 (26-for-130) against right-handers...yielded a .196average with runners in scoring position...allowed 9-of-24 (37.5%) inherited runners to score...beganthe season with Mobile, logging a 1-4 record, 13 saves and a 2.25 ERA in 34 appearances...pickedup the save in his first career relief appearance, April 8 at Carolina...allowed a season-high three runsMay 5 against Tennessee...was 0-4 with two saves and a 3.92 ERA over his first 15 outings throughMay 22...then tossed a season-high 3.0 scoreless innings and struck out a season-high five batters inthe second game of a doubleheader May 25 against Jacksonville...beginning with that outing, he didnot allow a run in 18 of his final 19 appearances with Mobile prior to his July 20 promotion...posted a0.77 ERA and converted all 11 of his save opportunities over that span...had scoreless streaks of 13.0innings (May 22 to June 17) and 11.0 innings (June 24 to July 17)...was 0-1 with six saves and a 2.12ERA in 14 relief appearances with Reno...did not allow an earned run over his first five outings (6.2 ip),surrendered three in his next three (2.2 ip) and finished the Triple-A portion of his campaign with a 1.18ERA over his final six appearances. Split his time between three teams, combining for a 5-8 record and a 4.30 ERA in 24 starts withSingle-A Visalia, Double-A Mobile and Triple-A Reno...had a career-high 117 strikeouts...yielded justfive home runs in 132.0 innings, an average of 0.34 per nine innings...allowed a .257 opponents batting average, including .240 against right-handed hitters and .280 against left-handers...began the season atVisalia and went 4-7 with a 4.24 ERA in 20 starts...tied for the Rawhide lead in games started and finishedsecond with 100 strikeouts...went 1-0 with a 1.84 ERA in three starts in April...was sent to RenoMay 3 and made one start for the Aces...allowed six runs on seven hits in 5.0 innings that day againstLas Vegas...had a no decision before returning to Visalia the next day...was 1-2 with a 5.40 ERA infive starts for the Rawhide when he was placed on the disabled list May 15 with a sprained left foot...was reinstated May 27 and lost each of his first two starts (9.35 ERA)...then went 3-3 with a 3.30 ERAover his final 13 starts...allowed just one run in a season-high 8.0 innings in a 10-1 win at Stockton June17...struck out a season-high nine batters in back-to-back outings, Aug. 3 against Bakersfield and Aug.8 at Modesto...was transferred to Mobile Aug. 17 and went 1-1 with a 2.89 ERA in three regular seasonstarts with the BayBears...made one relief appearance in the Southern League playoffs and retied theonly batter he faced. 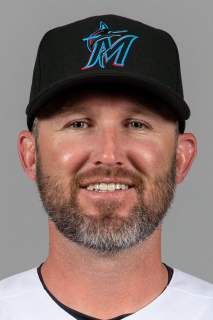 Was 11-11 with a 3.66 ERA in 25 starts for Single-A South Bend...tied for fourth in the MidwestLeague in wins and ranked 10th in ERA...the ERA was the lowest in the Diamondbacks farm systemand he also tied for fourth in wins...led the Silver Hawks in wins, starts (tie), innings pitched (142.2) andstrikeouts (103)...had career highs in wins, starts and innings pitched...yielded just five home runs in142.2 innings, an average of 0.32 per nine innings...allowed a .265 opponents batting average, including.234 by right-handed hitters compared to .302 by left-handers...surrendered all five of his home runs torighties...opponents hit .239 when leading off an inning...began the season with a five-game winningstreak, posting 2.61 ERA over his first six starts...the streak ended May 18 against Fort Worth when heallowed two runs in 3.0 innings before leaving the game with a blister on his finger...was placed on thedisabled list the next day...was reinstated June 2 and lost each of his first six starts following his returnfor a seven-game losing streak overall...named to the Midwest League Midseason All-Star team...compiledanother five-game winning streak over a six-start stretch from July 25 to Aug. 21 (1.36 ERA)...struck out a season-high nine batters in 5.0 innings Aug. 26 against Dayton...had a no decision in hislone postseason start Sept. 11 against Fort Wayne (7.0 ip, 3 h, 2 r, 2 er, 2 bb, 6 so). Made his professional debut with Yakima of the Northwest League and was 2-2 with a 4.64 ERAin seven starts...allowed a .272 opponents batting average, including .239 by right-handed hitters and.333 by left-handers...opponents hit .158 with runners in scoring position and two outs...was the losingpitcher in his professional debut Aug. 3 against Boise, allowing seven unearned runs in 3.0 innings...earned his first professional win Aug. 13 against Everett, striking out a season-high six in 6.0 innings. November 1, 2018 RHP Ryan Cook elected free agency. October 31, 2018 Seattle Mariners sent RHP Ryan Cook outright to Tacoma Rainiers. September 1, 2018 Seattle Mariners recalled RHP Ryan Cook from Tacoma Rainiers. June 22, 2018 Seattle Mariners optioned RHP Ryan Cook to Tacoma Rainiers. May 17, 2018 Seattle Mariners selected the contract of Ryan Cook from Tacoma Rainiers. January 16, 2018 Seattle Mariners invited non-roster RHP Ryan Cook to spring training. September 28, 2017 Tacoma Rainiers activated RHP Ryan Cook from the 7-day disabled list. April 6, 2017 Tacoma Rainiers placed RHP Ryan Cook on the 7-day disabled list. November 15, 2016 RHP Ryan Cook assigned to Tacoma Rainiers. November 14, 2016 Seattle Mariners signed free agent RHP Ryan Cook to a minor league contract. November 7, 2016 RHP Ryan Cook elected free agency. November 2, 2016 Seattle Mariners sent RHP Ryan Cook outright to Tacoma Rainiers. July 10, 2016 Seattle Mariners sent RHP Ryan Cook on a rehab assignment to AZL Mariners. January 7, 2016 Seattle Mariners signed free agent RHP Ryan Cook. December 2, 2015 RHP Ryan Cook elected free agency. November 6, 2015 Chicago Cubs claimed RHP Ryan Cook off waivers from Boston Red Sox. September 1, 2015 Boston Red Sox recalled RHP Ryan Cook from Pawtucket Red Sox. August 17, 2015 Boston Red Sox optioned RHP Ryan Cook to Pawtucket Red Sox. August 11, 2015 Boston Red Sox recalled Ryan Cook from Pawtucket Red Sox. August 3, 2015 Boston Red Sox optioned RHP Ryan Cook to Pawtucket Red Sox. August 2, 2015 Ryan Cook roster status changed by Boston Red Sox. July 31, 2015 Oakland Athletics traded RHP Ryan Cook to Boston Red Sox for Player To Be Named Later. May 3, 2015 Oakland Athletics optioned RHP Ryan Cook to Nashville Sounds. April 26, 2015 Oakland Athletics recalled Ryan Cook from Nashville Sounds. March 24, 2015 Oakland Athletics optioned RHP Ryan Cook to Nashville Sounds. June 3, 2014 Ryan Cook roster status changed by Oakland Athletics. May 31, 2014 Oakland Athletics sent RHP Ryan Cook on a rehab assignment to Stockton Ports. May 9, 2014 Oakland Athletics placed RHP Ryan Cook on the 15-day disabled list retroactive to May 8, 2014. Right forearm muscle strain. April 7, 2014 Oakland Athletics activated RHP Ryan Cook from the 15-day disabled list. April 3, 2014 Oakland Athletics sent RHP Ryan Cook on a rehab assignment to Stockton Ports. December 9, 2011 Oakland Athletics traded cash, LHP Craig Breslow and RHP Trevor Cahill to Arizona Diamondbacks for RF Collin Cowgill, RHP Jarrod Parker and RHP Ryan Cook. October 10, 2011 Ryan Cook roster status changed by Arizona Diamondbacks. October 1, 2011 Arizona Diamondbacks reassigned RHP Ryan Cook to the minor leagues. September 1, 2011 Arizona Diamondbacks recalled RHP Ryan Cook from Reno Aces. August 1, 2011 Arizona Diamondbacks optioned Ryan Cook to Reno Aces. July 30, 2011 Arizona Diamondbacks recalled Ryan Cook from Reno Aces. July 30, 2011 Ryan Cook roster status changed by Arizona Diamondbacks. July 25, 2011 Arizona Diamondbacks optioned Ryan Cook to Reno Aces. July 20, 2011 Arizona Diamondbacks selected the contract of Ryan Cook from Mobile BayBears. March 3, 2011 RHP Ryan Cook assigned to Arizona Diamondbacks. August 18, 2010 Ryan Cook assigned to Mobile BayBears from Visalia Rawhide. June 7, 2010 Ryan Cook roster status changed by Visalia Rawhide. May 15, 2010 Visalia Rawhide placed RHP Ryan Cook on the 7-day disabled list. May 4, 2010 RHP Ryan Cook assigned to Visalia Rawhide from Reno Aces. May 3, 2010 RHP Ryan Cook assigned to Reno Aces from Visalia Rawhide. April 16, 2010 Ryan Cook assigned to Visalia Rawhide from Yakima Bears. March 30, 2010 Ryan Cook assigned to Yakima Bears from South Bend Silver Hawks. June 2, 2009 Ryan Cook roster status changed by South Bend Silver Hawks. July 29, 2008 Arizona Diamondbacks signed RHP Ryan Cook.